At Interlagos, Sebastian Vettel showed once more that Ferrari possessed the right assets required to fight for the world title, as they ended a barren spell dating back to the Hungarian Grand Prix just prior to the summer break. However, despite the fact the Italian team was always competitive over the final part of the season, they never managed to make the most of the car's potential, for a variety of reasons. On this occasion, all the pieces of the jigsaw came together: the driver, the car, the reliability, every element delivered to its full potential. On Saturday, Vettel missed out on pole position by a whisker, his lap just 0.038s slower than that of Valtteri Bottas. On Sunday, a great start saw Vettel get the better of the Finn into Turn 1 and from then on he always appeared to be in control, even if he never quite shrugged off the attention of his pursuers. This result means that Vettel now has a 22-point advantage over Bottas in the drivers' standings and is now almost guaranteed the runner-up spot in the championship, something that probably is of less interest to him than to the statisticians. However, it is a morale booster for him and the whole team. Going into the winter break on the back of a win, with one more opportunity for victory remaining in Abu Dhabi, is always a fillip and we can look forward to a great battle at the final race. For the second consecutive time, Lewis Hamilton did not finish on the podium, but the Mercedes driver should be well pleased with his afternoon's work. 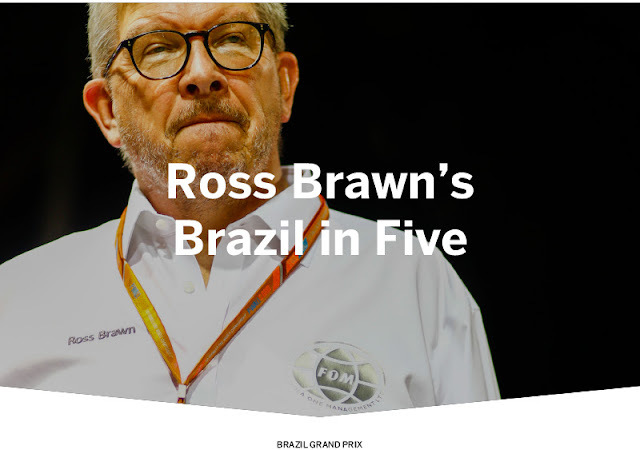 A couple of weeks ago in Mexico, delight at taking the title would definitely have cancelled out the disappointment of only finishing ninth, whereas in Brazil, the champion elect's performance would have softened the blow of not getting to the podium. Starting from the pit lane, after his qualifying crash on Saturday, Lewis staged an exceptional comeback, even leading the race on lap 30, before coming home fourth, right behind Kimi Räikkönen and just over five seconds behind his chief title rival, Sebastian Vettel. It's true that a new power unit in Hamilton's Mercedes meant he could fully exploit the car's technical strengths, but his pace and aggression when it came to overtaking were impressive and worthy of a four times world champion. And, as he said himself, he had a huge amount of fun. It was a special weekend for Felipe Massa. The Williams driver is retiring from Formula 1 at the end of this season and this was his final race in front of his home fans. I was pleased to see him get a good result and seventh was the best he could hope for, given the growing performance gap between the top three teams and the rest of the field. It was good to see him fight with grit and determination throughout the race, especially in the closing stages when he was battling with his former team-mate Fernando Alonso. I'm sure Felipe was really happy to beat him to the chequered flag. I've known Felipe since he came to Ferrari as one of the rising young stars of Formula 1 and I watched him grow up alongside Michael Schumacher, going on to confirm his place as one of the quickest drivers of his generation. I well remember how happy he was to win the race in Interlagos in 2006, wearing a race suit in Brazil's national colours and also, two years later, the pride and dignity he showed at this same circuit when he had to deal with the terrible disappointment of seeing the world title slip through his fingers, after, for a few brief moments, it had been within his grasp. I also recall the concern felt in Budapest in 2009, when he was the victim of a serious but unbelievable accident, followed by the delight of seeing him back behind the wheel, just as competitive as ever, a few months later. Felipe is a great person, honest and sincere, with a wonderful family around him and I'm sure that being on the podium after the prize-giving, along with his son Felipinho will be a moment he will never forget. Of course, there's still the race in Abu Dhabi to go, but symbolically, his new life as a driver and a person, starts now. Felipe, I wish you all the very best from the bottom of my heart. Ever since the end of the European part of the Formula 1 season, Red Bull has become steadily more competitive, taking two wins and four further podium finishes. It's true that reliability problems have cost them results, but at every race, they've had the pace to fight for a place on the podium, at the very least. However, in Interlagos, for whatever reason, Red Bull was a long way off its Mexican level of performance, where Max Verstappen dominated proceedings. Here the Dutchman finished fifth, over 30 seconds behind Vettel, while Daniel Ricciardo produced a great climb up the order from 17th after a first collision to sixth place at the chequered flag. However, the gap in performance to the front runners was somewhat demonstrated by the fact that the Australian finished 43 seconds behind Hamilton. Verstappen's race fastest lap will bring little consolation, even though the 1.11.044 is a new race record for this track. In fact, with nothing to lose in terms of position, the Dutchman was able to lap at this pace by fitting a new set of tyres for the closing laps. While this performance was an exception for the team his season, both Red Bull drivers never ran the risk of finishing lower than sixth, given that the gap to those behind them, a trio made up of Massa, Alonso and Perez – finished 20 seconds behind Ricciardo. That highlights that there is too big a gap between the three top teams and the rest of the field. But that's a wider topic for discussion for another day. Over 140,000 spectators (141,218 to be precise) attended the Brazilian Grand Prix over the weekend, an increase of 10% over last year. It's a significant number, especially given that both the Constructors' and Drivers' titles were already decided. The fact that so many fans wanted to bid farewell to Felipe Massa at his final Brazilian Grand Prix played its part, but above all, it confirms that Formula 1 is still incredibly popular in this country. That also explains why Brazil has one of the biggest television audiences in the whole world. There is a great Formula 1 tradition here, with multiple world champions in Ayrton Senna, Nelson Piquet and Emerson Fittipaldi, as well as many other top drivers such as Rubens Barrichello and Felipe, with whom I had the pleasure of working. Interlagos, too is a special place that generally produces spectacular racing. However, the most important thing is the passion of the fans, which you can feel more than at almost anywhere else on the calendar. And let's not forget that the fans are the most important part of this sport we all love.